Length (heel to toe)-10.5". Insoles-10.25". Width-3.75". VINCE CAMUTO BARITA. 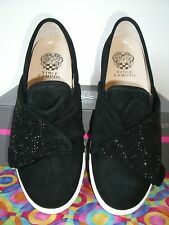 "BLACK"SUEDE Slip On Embellished Stylish Sneaker. Design: Slip-on sneaker with ruched knot detail; side elastic gore. Upper: Kid suede. Great with your Jean or with a Dressy Top and Leggings ! New without the box, Grasshopper black suede loafers with twill fabric vamp and elastic lace detail Cushiony insole No defects. No box Please note!!! To save you money on postage the shoes will be double wrapped and shipped Priority in a flat rate padded envelope. Bottom soles are slightly dirty. Shoe are in great, pre-owned condition. Shoes are pre-owned with light wear. Length (Heel To Toe): 10.5". Insole Length: 10.5". From a non smoking household. BELLA VITA WOMEN'S GREY SUEDE TRISH FLATS - NWOB - CLASSIC NEW SHOES! 2015 Chanel Thong Sandals CC T Strap 39 C 9. Condition is Pre-owned. Shipped with USPS Priority Mail. New Without Box $178 Manebi Paris Espadrilles from Spain Black suede espadrille , slip on, 1.25" platform Textile suede upper, leather/textile lining, padded insole Size 39 will fit 9 10.25” from heel to toe, 3.25” at widest point These are very wide! Isaac Mizrahi Live! 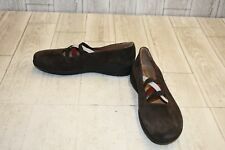 Alia Suede Moccasins with Bow Detail Brown Size 9 W NEW @. Suede Moccasins with Bow Detail. Moccasin silhouette, vamp bow with goldtone-tipped detailing, stitched edges, oval toe. Torrid Shoes Flats NWOB Black Suede sz 9W Career Fancy. Beautiful Torrid shoes new without box. The bottom soles are slightly dirty. The heels, toes, and sides of both shoes are fairly clean. Insoles are clean. Width: 3.5". Insoles:10". Brown leather strap with buckle accent. Size 9 Wide. High Fashion at Low Prices. Back to Top. Our idea of EXCELLENT CONDITION may differ from yours. We try to the best of our ability to describe the. Shoes are in pre-owned condition and show signs of normal wear. Outer soles has light dirt scuffs. There are white scuffs around the shoes. There is wear and scratches around the toes of the shoes. They are in excellent condition. The pictures shown are the actual shoes you will get.I've taken pictures of each shoe from all sides. I will do whatever it takes to make it right. All pre-owned shoes are graded on a poor, fair, good, excellent to like new scale. Basic black flats: back and better than ever! Style: Candra Blush. Information provided by Clarks. The dancer in you delights at the thought of wearing these ballet flats. Ballet Flats. Collection: Artisan. Leather upper; man-made balance. NOTE: Display; Very, very minor wear to soles/heels. Style: Atala. From ED by Ellen DeGeneres. Slip-on design, bungee vamp, neoprene collar. Women’s Lands’ End Slip On Boat Shoes, Brown Suede Leather, Size 9 D (Wide). Shoes are in excellent condition with little wear.